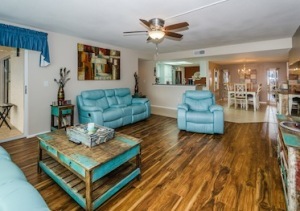 Boldly beautiful, this 3 bedroom/2 full bath Clearwater condo is packed w/upgrades. A popular split bedroom plan makes the 55+ home even more desirable. Newer installed ceramic tile is stunning in the kitchen/baths; offset by sleek Corian counters. The sparkling kitchen is remodeled & boasts a convenient breakfast bar & closet pantry & plenty of well-placed cabinets/drawers to stow appliances & holiday platters. New stainless steel appliances gleam. From the ideal kitchen with recessed lighting is the adjacent dining room with its stylish flow of tile, & the Great Room which affords the flexibility to arrange your furniture to suit your lifestyle. New laminate flooring runs in the Great Room, the master & secondary bedrooms for a contemporary/easy-care solution; sliding doors to the screened & tiled porches reveal natural light reflected from the smooth ceilings relieved of their dated popcorn finish. Besides its freshly painted interior, new six-panel doors throughout add the perfect polished touch. For the generously-sized master bedroom w/ walk-in closet, another set of sliders & spotless bath make the suite complete with dressing area/private shower room. New electrical wiring for new ceiling fans/chandelier, alarm system, newer AC system, inside utility, newer vinyl windows on both screened porches, carport, a secure lobby entry/elevator are all tucked away behind Countryside Blvd & its easy access to US 19; minutes from wonderful new shops, restaurants, theatre, & soon to be opened Whole Foods Market.